Would Bright shine as strongly as I hoped? "While the full menu will be served throughout, we want people to feel as comfortable dropping in for a quick glass of wine or a bowl of pasta at the bar as they would booking a table for a special occasion and really getting stuck into the menu and the cellar." 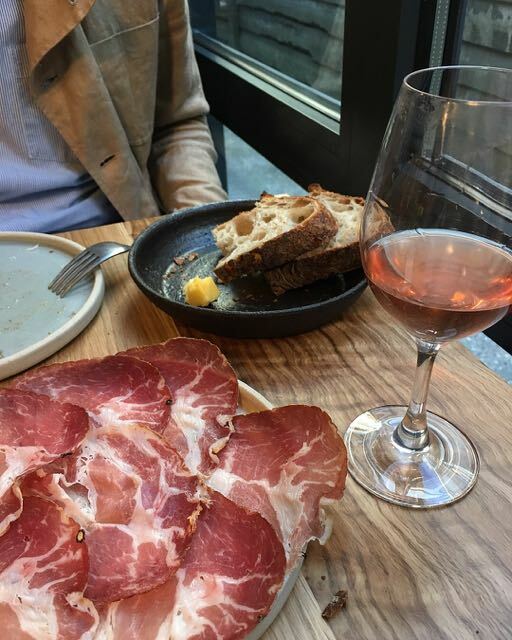 It's impossible to write about Bright Restaurant without mentioning P. Franco, the wine shop and bar on Lower Clapton Road E5 set up by Noble Fine Liquor that has been a mecca for good natural wines and food since spring 2014. 2017 saw it named by Eater London as its Restaurant of the Year, despite the bar's two-plate induction hob, miniscule kitchen set-up. 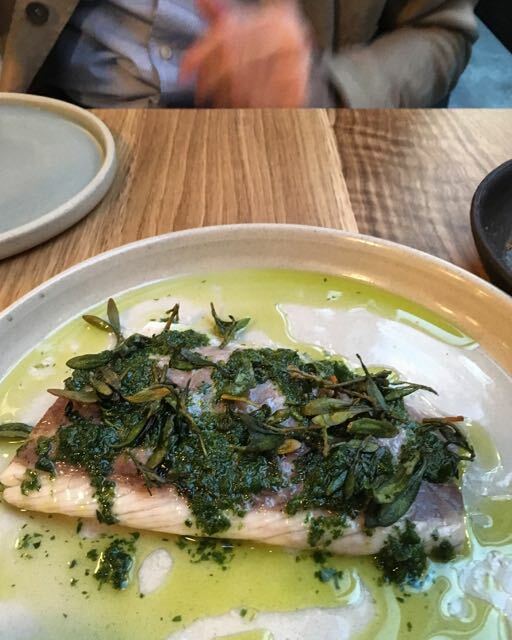 Said kitchen operates from Thursday to Sunday with a rolling roster of some of the best chefs in London. William Gleave, Tim Spedding, Anna Tobias, Giuseppe Lacorazza and Peppe Belvedere have all cooked there. Out of this much-loved Hackney bar has emerged Bright Restaurant and wine bar. The promise of great wines, a proper kitchen, a strong kitchen brigade and front-of-house made for my most anticipated opening of the year. Located in the former home of the much admired Ellory Restaurant (now re-opened under the name Leroy in Shoreditch) Bright occupies the ground floor of Netil House, close to London Fields. So far, so involved, but the set-up at Bright couldn't be clearer. The kitchen brigade is strong and changes only in that there are two co-chefs: William Gleave, a Tasmanian with a clear love of Japanese food who earned his London reputation cooking at some of my favourite places like Brawn and 40 Maltby Street; and Giuseppe Belvedere, ex head-chef at Brawn who brings his Sardinian and Italian heritage to the kitchen. As mentioned, both having served their time at P.Franco, of course. Phil Bracey, half of Noble Fine Liquor is in charge of the drink and Lulu Tindal, formerly of Lyle's, Manages front-of-house. On the first visit, we dived right in. 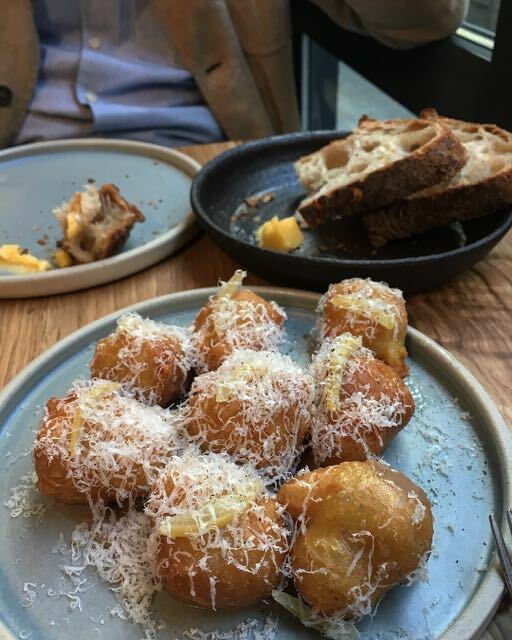 It was the generous helping of Fried mozarella pastries with a slick of anchovy sauce and slice of preserved lemon that sparked our appetite. Helped along by the glass of sparkling pink bulles, it set the tone for what was to follow. And what followed was a plate of finely sliced, well-marbled Capicola Calabrese, with a richness of flavour that comes with the best quality salume; a punchy dish of Mezzo maniche (short-sleeved) pasta tossed in pesto cetarese and a southern Italian touch of fried breakcrumbs; delicacy followed in the form of a juicy steamed fillet of Silver Mullet with sea herbs; there was asparagus, baked, of course; sweetness arrived, before pudding, in the form of a pork chop. Cooked on the bone before being served de-boned and sliced, it was the fattiest piece of pork I've ever seen and the most delicious. The slices of caper berries and sautéed radishes brought the right amount of heat and piquancy to cut the fat of this Swaledale beauty. 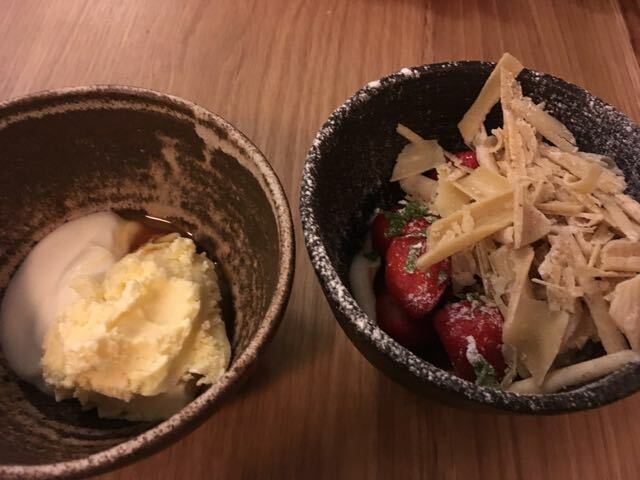 There was Iced milk & caramel, and Strawberries & cream, the epitome of lightness and with just enough of an element of surprise to make you glad you'd ordered them even if you were full. Portions throughout are generous. Snacks and small plates range from £6-£13, pasta and mains £11.50-18. Wines by the glass are reasonably priced - starting around £6 up to £11. They're coming from a welk-stocked cellar so expect to find plenty of good bottles. The second time a 'quick glass of wine' at the bar was the aim. 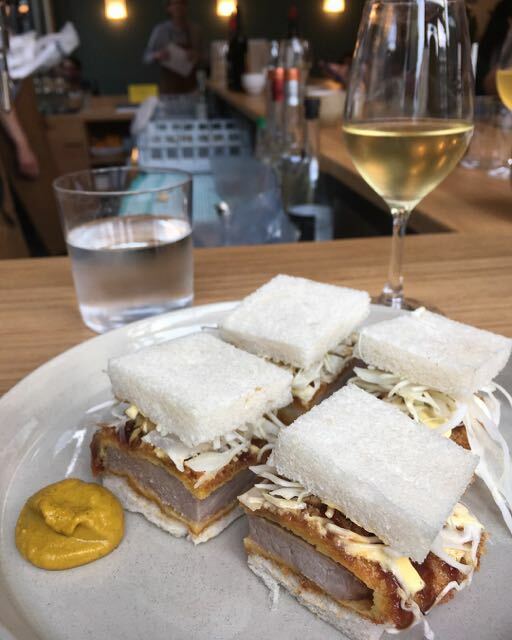 From the 'Snacks' menu came a Katsu sando - thick slice of pork dipped in batter, fried, topped with shredded raw cabbage, an aromatic sauce and sandwiched between white pappy bread - hot, hot English mustard on the side. So right. 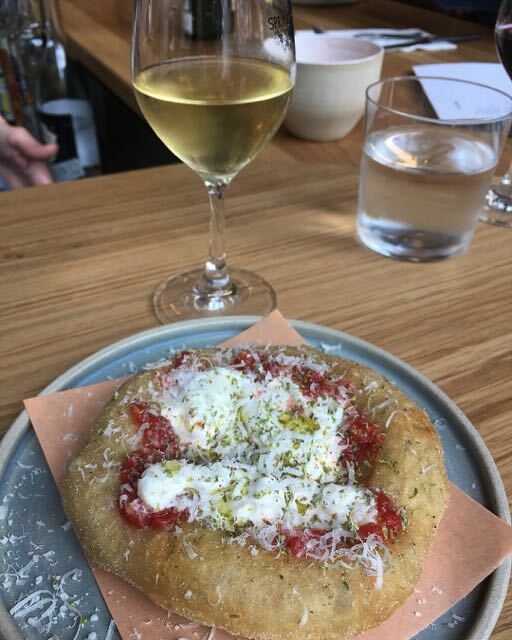 A Pizza fritta arrived, puffed up and pillow-soft, topped with goat's curd and tomato, good olive oil and oregano. What at first seems an odd name for a restaurant makes sense once you've experienced this new opening in Hackney. If the team are aiming for creativity of menu, vivid combinations, intensity of flavours and blazing delivery. It's all there at Bright. The sourcing is careful. The menu changes to suit the best ingredients they can get their hands on. The kitchen team is a dream, working with real flair backed up by sound techniques. They can do gutsy or delicate with equal confidence. Everything I've eaten here has been deliciously seasonal and full of flavour. The front-of-house team is friendly and know what they are about. 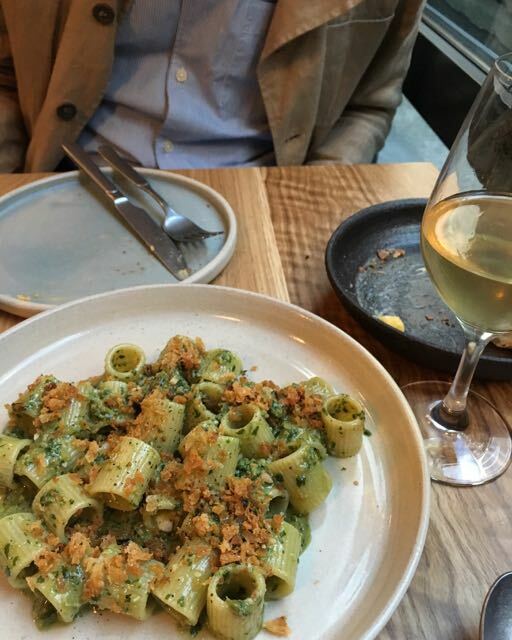 Whether I go for that quick glass, the bowl of pasta or to get stuck in, I think I'll be leaving happy.